This issue opens on an action sequence. Cars take off for a race no one can win, in a scam that has drawn Batgirl to the scene. While she deals with the criminal element, we see that Batman and Robin are keeping an eye on things. Batgirl removes her mask, and we find out who she is. As she goes about her everyday life, we get a flashback sequence that shows how she came by the costume and what led to the previous Batgirl vacating it. Meanwhile, Barbara Gordon spends some time with her dad as they adjust to living near one another again (a plot point begun this past spring in the Oracle mini-series during Battle for the Cowl). As Batgirl is once again drawn into action, we see that she has a long way to go to measure up to her own ideals. The issue closes with her meeting someone who’ll be either mentor or foe. The issue’s art doesn’t blow me away–it’s good, solid stuff, but that’s something I really expect from any comic I read. I like that all the characters I know are recognizable visually and not just contextually. While I’m sure there are subtleties I’m not picking up on, for a new reader such as myself, the style works just fine and does what a comic’s art should do. My only real complaint with the art is the structure of the cover. 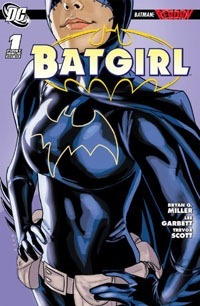 We’re shown the title character from the waist to nose, with an emphasis on her…feminine curves (where the outline of a bat–her personal logo–is situated). I assume the intent is simply to emphasize the character’s chest-emblem since we’re not supposed to know who is actually in the costume. Unfortunately, the outline of a bat around the word "Batgirl" denoting the comic’s title takes away from that…and makes it seem there’s a bit of emphasis on Batgirl’s chest. The story itself isn’t bad, though it doesn’t have me all that excited about what’s to come. I’m mainly interested in seeing what’s to come with Barbara Gordon and how she handles the new Batgirl than I am Batgirl herself. I expect I’ll give this at least a couple more issues to really draw me in. If I were to decide from this first issue alone, I do think I’d give the series a pass for now and see if anything develops, then play catch-up if interested in the developments. All in all, a solid first issue as first issues go…and it’s very much to the writer’s–or DC’s–or WHOEVER’s–credit that the "mystery" over "Who IS Batgirl?" 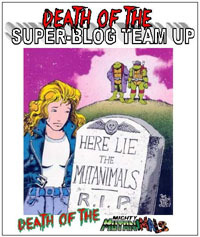 has been more for the solicitations on the series than some point within the series itself. That we have the identity of this Batgirl on page 6 of the first issue (the title page of the issue) allows me the interest I’m sure I would NOT have had if the identity was kept secret from the readers. If you’re interested in Barbara Gordon, or the Gotham characters in general, or just this side of the "bat-family," this issue is worth picking up–at the least it gives you the debut of a new Batgirl, context for her and potentially where she’s going, and you get to see Babs’ story continue and where that may lead in the near future. I suppose I shouldn’t be entirely surprised, yet I still managed to be: after three issues building toward something HUGE…this felt very anti-climactic. Rather than coming off as "organic," to me–at least on this initial read-through–it came off as rather forced and after-the-fact than an organic, planned development. We open on Mxy going off on Superman…or at least A Superman. In Mxy’s pocket-existence where Jon’s being held, A Superman and Lois have arrived. Jon recognizes them…they fail to recognize him. While Mxy revels in the chaos, even taunting this Superman, Jon realizes with horror that the woman he believes to be his mother doesn’t even remember him. While two spheres of blue energy approach Jon, Mxy opts to leave, warning of someone far beyond even himself as the cause of everything. That he–Mxy–was merely taking advantage of a situation already present. Channeling power from the blue ‘ghosts’, Jon manages to oppose Mxy, who offers him one last chance to leave this existence. Jon refuses, and Mxy leaves. As the reality crumbles, the blue energy merges with the New 52 Superman and Lois, restoring their memories of Jon and their lives together…and all reality re-knits, merging what we knew from pre-Flashpoint and the New 52 into one continuity, with Superman simply…Superman. But married to Lois, and with their son–Jon–as Superboy. Somewhere else, Mr. Oz looks on and marvels at the situation, at the love shared between Lois, Clark, and Jon, and how it unites realities. And finally, a hint that there’s someone–and/or someTHING–else out there still influencing things. I feel like this was telegraphed a mile off, so to speak. New 52 Superman and the "real" Superman would merge, their realities fused/merged into one, to simply BE Superman, supposedly no more "divide" and smooth over stuff. It doesn’t really work for me, as far as the in-story stuff goes. I could even have probably "bought" the notion of Mxy re-setting stuff somehow, though usually his machinations are undone when he disappears. Just continuing to merely "hint" at something else out there is getting old, and I’m ready to just be TO whatever ‘event’ that will be, and get beyond it. To just have A single DC Universe, even if it’s actually a multiverse, and either the New 52 completely wiped away or officially merged and just have a set UNIVERSE that is what it is and get on with stuff. Visually, parts of this issue were quite "off" for my preferences, but not bad. I really like the "new costume" for Superman, essentially being the classic costume minus the trunks, and a modified (solid) belt (instead of the dots of red thing that’s been going on awhile). We seemed to have pre-Flashpoint Lois and Clark turned into energy and merged with the New 52 versions…but then a sort of switch up with the new costume, and it seems that Jon’s been given additional power (I had it in my head that he couldn’t fly, and he seems to be, here). 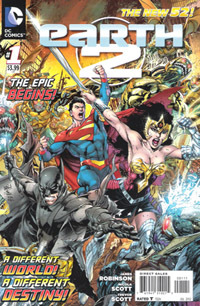 This resolution and issue as a whole seems to be an attempt to bring stuff together and "unify" fans of either Superman by making it so that both are one and the same–that New 52 Superman was always part of THE Superman, and the pre-Flashpoint Superman we had from Convergence, Superman: Lois and Clark, and the past ten months of Rebirth was not himself whole, but is now, with the merging of the new. This combined with stuff from last November’s Superman Annual would seem to have stuff in line for that, to firmly establish Superman is Superman and now whole, PERIOD. There’s still plenty of dancing around the fine details…even with the double-pager showing stuff from "both" continuities, it’s hard to tell–for me, at least–exactly what’s what, or supposed to be what–and what’s just looking different because of the artist’s rendition. 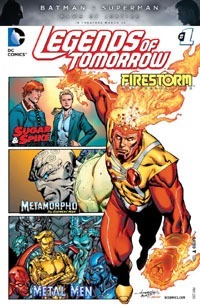 While I’ll grant that the "new costume" deserved its full-page "reveal" and the double-page spread of the "new history" deserved the room, I’m also a bit disappointed at how quick a read this was. 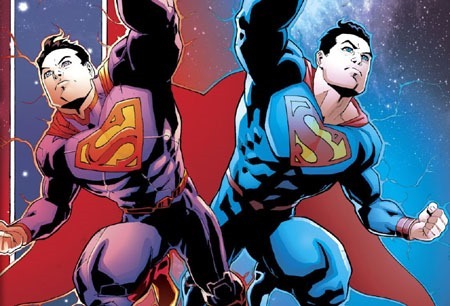 My feelings on this issue are certainly victim to the "hype machine," and to wanting to see some overt reference to Superman Red/Superman Blue, to SOMEthing more with the notion, at least, of Red and Blue, and some overt explaining of things. Instead, a lot seems to have been left to the visuals, to whatever the reader wants to interpret. 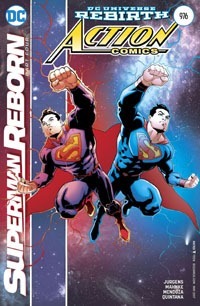 Maybe it’s stuff to be explored in coming issues–but to consider this a conclusion seems to understate things, and though I certainly appreciate NOT having stories stretched out, I think Superman Reborn certainly deserves to be at least another chapter or two, to really lay things out and concretely state what’s what and when and all that. Superman Reborn started strong, with a lot of epic possibility and potential. Sadly, it–at least for me–ends far short of what I’d hoped for, underwhelming me despite itself. I trust that stuff will play out in coming weeks and months, with further details and ramifications touched on…and hopefully this mainly just means that we’re NOT locked into "the graphic novel" of exactly X issues to a story with hard stop/starts. Perhaps this is just a "main event" and the full details WILL be revealed here and there–organically–as things continue. I had to go to two different shops to find a copy of this issue, and got the last copy at the second shop…so I’m pretty sure that a number of people have been grabbing this issue even if they hadn’t been getting previous issues. Perhaps the nostalgia, more likely the hype–particularly from sites like Bleeding Cool–and jumping on for whatever this one issue would hold, regardless of continuity. Story-wise, art-wise, it’s a solid enough issue (note my feelings of its failings above) well worth getting if you’re already following either/both titles or this particular story. But it’s not worth the "hype," at least on one read-through and thinking on it. That said, I won’t be surprised to have my feelings on it changed by further thought, analysis, and points of view…this post simply being my initial thoughts/reaction to the issue on a single read-through. Well, that’s an extremely long list of creator credits for this issue! For purposes of this post, I suppose that’s my fault, as I’m not breaking them up for individual-segment thoughts on writing/art/etc. Because while I read the issue, I quickly realized it’s a collaborative one-off piece…essentially a bunch of characters coming together, hanging out, exchanging stories while doing so…and different creators handling the different parts that are then stitched together into this single comic book. I found this issue in a quarter-bin, and the main reason it even caught my attention was the "generic" Wildstorm in the title…then drew me in with the Chamber of Horrors bit. Hey, Halloween is almost here, and I haven’t acknowledged October. So I’d thought ok, I’ll get this issue, and maybe read it in time to do a post before Halloween. So here we are. I know the "high points," or the "bullet points" of Image in the ’90s…and largely consider (personally) that most of what gives "The ’90s" a bad rap in comics IS the Image stuff. And while there’s some nostalgia for me, I’ve yet to really dive in and erase the blind spot so much of ’90s Image still has for me. That said, or as such…I’m not all that familiar with characters in this issue…very few by name, just looking at them. I recognize a few, and a couple others sort of look familiar…but this is a jam piece I fail to appropriately "appreciate," I’m sure. This issue is–as said–a "jam piece," with 5-6 "creative teams" involved in multiple segments that collectively make up the issue. At its core, characters come together and wind up in their own space at a party, but outside of "authorized space" at the museum that’s hosting them, and are free to tell stories amongst themselves that would not work for a general public. So the characters swap stories about horror situations they’ve found themselves in–from dating/making moves on a body possessed by spiders, to experience with the Salem Witch Trials, to a mirror that led to horrible versions of what should have been one’s best dream. As a whole, this issue was entertaining enough. Reading it, I simply breezed through–I noticed the visual changes, but the story overall seemed relatively seamless…or at least, nothing jarring that didn’t mesh with the other parts. As said, I’m not familiar enough with any of these characters or individual series to come to the table with any real expectations, so stuff really just "is." The art’s not bad in and of itself…though I really "see" a lot of ’90s Image in the stuff (considering this IS "’90s Image," that’s to be expected!). For a 25-cent purchase that I had zero real "expectation" for going in…I honestly enjoyed the issue, and it was worth the purchase and reading. Despite the title, and the cover, other than it incidentally being the characters gathering around a Halloween party, this could be "any time," just messed-up situations or "out there" stuff. I never knew this issue existed, nor sought it out. I wouldn’t say it’s really anything to go to great lengths to acquire…but it’s worth a 25-cent purchase/read-through, and can serve (at least visually) as a sort of "sampler" of stuff being put out at the time. There’s an ad in the back of the issue for a $30 "chromium" poster version of the cover…which makes me wonder if there might be a "chromium" version of this issue out there somewhere. If there is, I obviously haven’t seen it. The cover image gives me a bit of deja-vu…so perhaps I’ve seen it before without consciously taking it in; maybe I’ve seen the poster; maybe just the ad. (Or perhaps there’s some promotional trading card from Wizard with this image on it that I’ve seen). 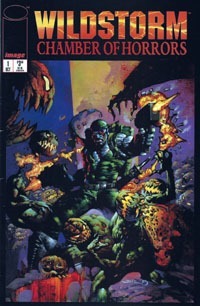 Though titled Chamber of Horrors…you could definitely find worse horrors than this issue. Offhand, this issue is my earliest memory of the Captain Marvel character. If I was “aware of” him prior, it’s not a conscious memory. I wanted to re-read this issue given my recent foray (October 2013) into the Shazam/Captain Marvel character, as well as for the nostalgia. That, and while not from the 1970s or 1980s, I would have pegged this as a perfect issue for the Superman vs. Shazam collection…and this is certainly the issue that I think of when I think of the two characters fighting. 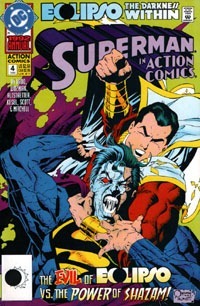 The issue’s cover is fairly iconic for me, showing an Eclipsed Superman struggling with Captain Marvel, captioned The Evil of Eclipso vs. the Power of Shazam! It’s rather interesting to realize the cover is by Joe Quesada and Jimmy Palmiotti, given Quesada‘s eventual and current involvement with Marvel. The 11-year-old Me certainly had found it engaging, igniting curiosity as to the Eclipsed Superman and who this other guy was that he was fighting. The interior art, while not nearly as thrilling, gets the job done. Particularly on this re-read, I was more interested in the characters and interactions than the actual art, though nothing about it particularly screamed “go find more that matches this art!” Given this is an extra-sized issue produced simultaneous with the weekly ongoing saga in the main Superman books, and is from 21 years ago, it’s not a great concern and largely gets a pass as such. The story itself is a bit mixed. On one hand, I’ve read this before, I know the overall bit of the Eclipso: The Darkness Within ‘event’ and where things go; I have a fuller context all these years later of the characters, situations, and so on, so it’s hardly as engaging as it was originally. The story picks up with a town having been captured by Eclipso, and the heroes are unable to reclaim it. The only condition by which he’ll relinquish his hold is in trade for Superman’s body–which he has, thus far, been unable to possess. Given this is Superman, of course he agrees–willing to sacrifice himself for the good of others (regardless of all the potential harm that could be done by Eclipso controlling his body and powers). 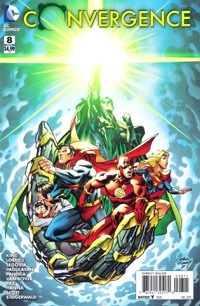 While he makes the deal with Eclipso, the other heroes begin a plan to combat an Eclipsed Superman, which involves bringing in Captain Marvel–the only one to truly have a chance of going toe to toe with the Man of Steel. The story itself isn’t terribly deep…though it does provide reasonable motivation for what occurs…stuff doesn’t come outta nowhere (such as Captain Marvel just happening to “fly by” at the exact moment he’s needed…he actually has to be called in). We have broad, ongoing plot points of the Eclipso: The Darkness Within story in general, and this feels much more like a key point in the event rather than “just” the “encounter of the week” with a Black Diamond. I actually paid $4 for this copy of the issue, for the immediate gratification of getting to re-read the thing without having to dig through umpteen longboxes or quintuple the issue’s cost paying for shipping, etc. Despite paying that kind of money for a 21-year-old comic that typically oughtta be 25 or 50 cent-bin fodder, it was worth it for the reading experience…especially given the cost matched virtually any current Marvel, many current DC, and anything presently on my pull list–yet this issue has more than twice the content of a current series (in some cases, nearly 3 times the content!). If you can find this in a bargain bin or just have an interest in Superman and Captain Marvel/Shazam fighting, this is definitely a worthwhile issue. Ditto if you’re looking for just a handful of the Eclipso Annuals from 1992.